Rosemary Randall was very pleased to be invited to deliver one of the lectures in this year’s Cambridge Climate Lecture Series. She says "It was a big departure for CCLS to include something other than science in the series and I was delighted to be made so welcome." The title was ‘Climate, Psychology, Conversation: the unconscious dynamics of how we talk about climate change’. You can view the lecture here. 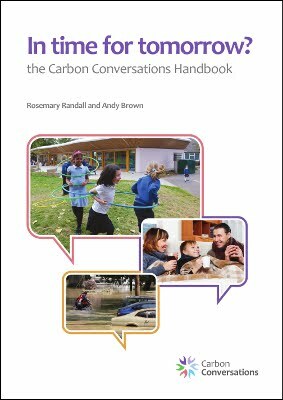 The talk draws on the material in the chapter "Talking with Friends, Family and Colleagues" from In Time for Tomorrow" (Chapter 6 or Chapter 3 of the international carbon conversations handbook; both still available to download) as well as recent research and writing. Rosemary also ran a related workshop for local Sixth-Formers called ‘Finding your Voice’ about climate change. "In Time for Tomorrow" comes out in Dutch. sprints of an afternoon of co-working etc." "The book has generated new interest and ambassadors, [and is distributed] always coupled with a workshop experience. Which, funny enough, also makes it a bit more exclusive to have." We think it looks fantastic. KlimaatGesprekken have done an amazing job - we love the design and illustrations. Congratulations to everyone involved. 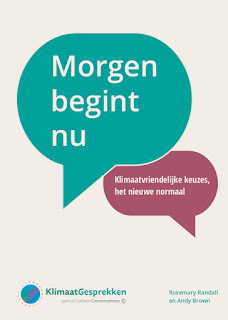 The text KlimaatGesprekken used is "ITFT international" , available on the materials section of the ClimateConversations RiseUp list website. A number of Climate Change groups are using the Carbon Conversations games to engage local people in the issues of carbon reduction. Leeds Carbon Conversations is running a Facilitators Training Course supported by The Surefoot Effect on 15th to 17th October in central Leeds. Following a Partnership Citu (a housing developer building incredibly energy efficient homes in Leeds Climate Innovation District) and University of Leeds (through Milena Buchs - see previous article) 4 members of Citu staff are participating and plan to roll out Carbon Conversations to all employees. The University will evaluate the impact of the groups they run on staff carbon footprints before and after. Other places are open to anyone wishing to train to run Carbon Conversations in the Leeds or West Yorkshire area. There are only a few places left so please contact us as soon as possible if you are interested in attending. leedsconversations@gmail.com. Can interviews with the carbon calculator reduce people's footprints? New research by Milena Buchs of Leeds University and author of previous research on Carbon Conversations has been exploring the effectiveness of our carbon calculator. You may know that Carbon Conversations grew out of a project that conducted interviews with the public using the Centre for Alternative Technology's carbon calculator as a way of raising people's awareness of climate change. Those of you interested in the wider psychology of climate change may be interested in some upcoming events in the UK and in some publications. Our friends in France ask if you could help them by voting for the “Conversations Carbone” project so they can get enough “citizen votes” to be selected by the “French Ministry for Ecological and Fair Transition”. They have applied to a program called “mon projet pour la planète” and the target is to get over 500 votes before May 11th.